Certainly, this blog is no "dalang" and threat. Its far from able to create tension as accused by Anwar. 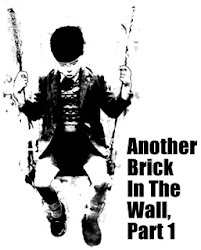 Its just "another brick in the wall" with a view on the current management of Lembaga Tabung Haji (TH) and their actions. Nevertheless, a debate with Mowardi is most welcoming. Its the publicity BEBASnews.com should be craving for. However, Mowardi does have to be more specific and factual to deal with hard hitting investigative portal like SABAHKINI2. Their expose on wrongdoings and conflict of interest by one of the Empress Dowager's has meat and verifiable documents. 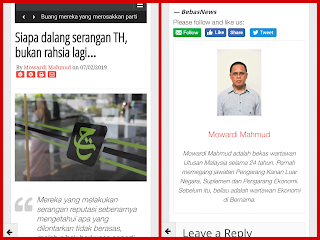 If BEBASnews.com was hired by Datin Wan Norhiyati Wan Ibrahim (Yati) to spearhead the corporate communication of TH on social media, Mowardi should not bring the melancholic suratkhabar Melayu style on social media. It is not educating the public and may not work even with kampong folks, especially those with social media accounts. They could lose confidence and a run on TH to ensue. Mowardi cautioned on “menelan bulat bulat” (blindly believing). Isn’t that what the Minister and TH is doing through the court of public opinion? Aren't they hoodwinking the public with manipulated information and public execution, without trial? Then, he mentioned about “ikan menjadi lauk” (taking someone as victim). Isn't there many previous members of the management being victimised? And, isn’t the blame game an extension of over politicking and at the expense of the Malay strategic interests? And, he claimed it is character assassination. The current management seemed to be only one of the Empress Dowager (note the singularity), Datok Zukri Samat, and Datin Wan Norhiyati (Yati). No critic of management could be done without touching these characters. But then, is the series of police reports and MACC report not a media circus and character assasination? Empress, Zukri and Yati has a history of assasination beyond characters to turn their victims bankrupt, reputation and career destroyed, and life suffered. A seasoned economic reporter should certainly investigate before his firm simply take up any client. There are many more issues and line by line of Mowardi's can be scrutinised and expanded. Lets put them aside and not make a big deal over his writing style. Firstly, this blogger is no better a writer. Secondly, it is better that Mowardi defend the attack on Zaiton Hassan by Sabahkini2's "Tabung Haji dalam bahaya, integriti Zaiton Hassan pengarah baru dipersoal" with answers. A dedicated investigative portal like SABAHKINI2 will not do so without insider leads, fact and supporting evidences. Though MACC may have denied their claim of investigation on UZMA, they did shake the establishment and Rocky Bru questioned MACC for too late response. The client Mawardi is defending is misleading the public. Hibah 2017 was declared based on Realisable Value (RV) of RM74.7b, and not Net Book Value (NBV) of RM70.3 billion. The Tabung Haji Act 1996 (THA 1996) never mentioned to follow accounting based on NBV. A 24-year economic reporter would have surely understand RV, NBV and learned up THA 1996 before writing! The second police report on the sales of 95% interest in PT TH Indo Plantations was fully paid. According to sources, police themselves are puzzled as to why the need make the report when payment already made. It is like Tommy Thomas establishing an EC Tribunal to investigate six former members who have resigned and at the same time, deceived the Acting King, Sultan Nazrin for consent to establish the tribunal. Get specific and technical. Then, "bebas" journalism and freedom of the press is truly towards truth, justice and nationbuilding for alif, ba, ta and not defend a "pencuri, penyamun dan perompak". If it is to resort to civil lawsuit and and maleeva injunction against previous members of management, it will prove us correct. Current management leadership will be proven as truly evil, vindictive, and crazy for power. Come join forces with us for sake of truth and justice. No worry about paying personal and portal bills. Have faith in Allah. Been through it and left fate be decided by the Almighty. It never fail. 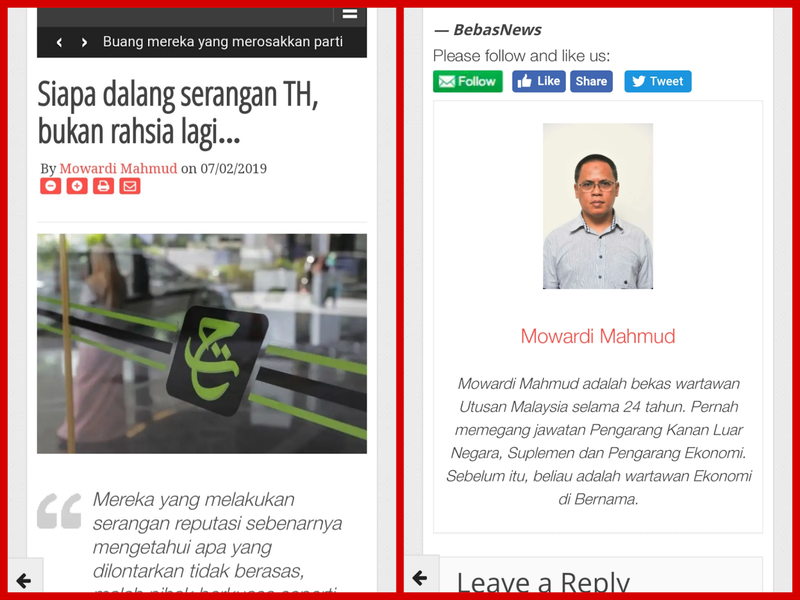 Aiyo ... BEBASnews,com makan dedak TH. Taklah bebas. Tun M tak marah ka ...?